Ness Nusli Wadia (born 30 May 1971) is an Indian businessman. Part of the Wadia family, where his parents and several family members are all involved in business—he is also the great grandson of the founder of Pakistan, Muhammad Ali Jinnah—thus making him a direct descendant of Jinnah. Wadia is the Managing Director of Bombay Burmah Trading Corporation, a company which has holdings in most of the Wadia Group subsidiaries, including an indirect majority stake in Britannia Industries. He was the Joint Managing Director of Bombay Dyeing, the flagship company of the Wadia Group, till March 2011 when he stepped down from the post. 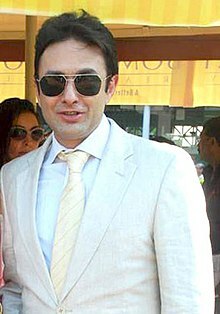 Wadia is a co-owner of the Indian Premier League cricket team Kings XI Punjab. Wadia was born into the Parsi family in Liverpool, England. His parents are businessman Nusli Wadia and former airhostess Maureen Wadia. He is the grandson of Neville Wadia and Dina Wadia, and the great grandson of Mohammad Ali Jinnah, the founder of Pakistan, and his Parsi-born wife Rattanbai Petit; the later of whom was a part of the elite Petit—Tata family. Ness and his brother, Jehangir Wadia, are the direct and only descendants of Jinnah and his family, after their father. Ness' younger brother, Jehangir, is the Managing Director of group companies Bombay Dyeing and GoAir. After completing his education at The Cathedral & John Connon School as well as Lawrence School in Himachal Pradesh, and then at Millfield School in the UK. Ness studied International Relations at Tufts University near Boston, Massachusetts, and then went on to do his M.Sc in Engineering Management at University of Warwick. Wadia joined Bombay Dyeing in 1993 as a Management Trainee. During his earlier period he was closely involved in marketing and retail distribution of the textile division of the company and was active in various organisations such as the Cotton Textiles Export Promotion Council (TEXPROCIL) (a council he once chaired), Mill Owners’ Association (MOA), Associated Chambers of Commerce & Industry of India, etc. In 1998, he took a leave of absence to complete his master's degree in Science of Engineering Business Management from the University of Warwick with a thesis titled "Leading to Success in India". After receiving his master's degree in 2001, he returned as Deputy Managing Director of Bombay Dyeing and was later promoted to Joint Managing Director. He was appointed to this position on 1 August 2001 and stayed till March 2011, when he stepped down, and younger brother Jehangir was made managing director. Ness was appointed Managing Director of Bombay Burmah Trading Corporation. In 1998, 1999 and 2000 he was appointed on the Prime Minister’s Council on Trade & Industry and in September 1998 was appointed the Convenor of the Special Group Task Force on Food and Agro Industries Management Policy in September, 1998. Wadia serves as director on the boards of group companies- Britannia Industries Ltd., Wadia BSN Ltd., and Nowrosjee Wadia & Sons Ltd. He is also a director of Gherzi Eastern Ltd., Tata Iron & Steel, Tata Chemicals, and other companies and is also a member of the Managing Committee of the Nehru Centre in Mumbai. In 2008, along with actress Preity Zinta and businessman Mohit Burman, Wadia acquired ownership rights for the Mohali-based Twenty20 cricket team of the Indian Premier League (IPL). The group paid $76 million to acquire the franchise, and named the team Kings XI Punjab. Ness currently serves as Managing Director of Bombay Burmah Trading Company Limited and Chairman of National Peroxide Limited. He also serves as Director on Boards of various Wadia Group companies such as Britannia Industries, Bombay Dyeing, GoAir and Wadia Techno Engineering Services. He sits on the Audit Committees of GoAir, Britannia, Bombay Burmah, and NPL, the Finance Committees of Bombay Dyeing, Bombay Burmah, and Britannia and also the CSR Committees of Bombay Dyeing and Britannia. He is actively involved in the overseeing the Wadia Hospitals in addition to the Group’s educational establishments. Being a trustee of Sir Ness Wadia Foundation, and other charitable trusts within the Wadia family, he drives the Group’s efforts in bridging the socio-economic gap that exists in the society. Ness is a Board Member of Wadia Hospitals where he has played an instrumental role in bringing a positive transformation at Wadia Hospitals and shown great compassion towards the underprivileged Women, Children, and deprived sections of the society. Wadia dated Bollywood actress Preity Zinta from February 2005 until 2009, and the couple were subject to intense media scrutiny. On 13 June 2014, Zinta filed a complaint with the Mumbai police against Wadia alleging he had attacked her at an IPL match at the Wankhede Stadium in Mumbai on 30 May. Wadia has denied the allegations. ^ "Bombay Dyeing Management: Jeh elevated, Ness steps down". The Times of India. 30 March 2011. Retrieved 2 May 2011. ^ a b "Wadia Group Re-shuffle". MoneyControl.com. 30 March 2011. Retrieved 5 May 2011. ^ a b c "Preity Zinta, Ness Wadia, Karan Paul, Mohit Burman". The Times of India. 2 April 2008. Archived from the original on 23 May 2009. Retrieved 9 May 2009. ^ "Promoters of Kings XI Punjab". Kings XI Punjab. Retrieved 9 May 2009. ^ "Ness Wadia: Photoshoot". The Times of India. Retrieved 9 May 2009. ^ a b c d "Bombay Dyeing & Manufacturing Co. Ltd. (BDYN:Bombay Stock Exchange)". Businessweek.com. Retrieved 10 May 2009. ^ Bollywood Hungama News Network (24 January 2008). "King Khan, Preity Zinta bag teams in IPL bidding". indiaFM. Retrieved 9 May 2009. ^ "The Kings XI, Punjab". Sify. Retrieved 9 May 2009. ^ "list of directors". bbtcl.com. ^ "Ness to revamp Wadia hospital". mid-day.com. ^ Shaikh, Jamal (3 February 2005). "Preity woman's man". The Times of India. Retrieved 9 May 2009. ^ Subhadeep Bhattacharjee (1 July 2009). "Preity heartbroken; Ness finds new love". Oneindia Entertainment. Retrieved 17 January 2013. ^ "Ness spotted with Delhi-based heiress Ayesha Thapar". Daily News and Analysis. 25 June 2009. Retrieved 17 January 2013. ^ "Preity's Ness Finds New Girl Friend: Ayesha Thaper". Zimbio. Retrieved 17 January 2013. ^ "Bollywood Actress Preity Zinta Files Molestation Case Against Business Tycoon (Report)". The Hollywood Reporter. Prometheus Global Media. 14 June 2014. Retrieved 14 June 2014. ^ "Preity Zinta files molestation complaint against Ness Wadia". The Times of India. 14 June 2014. Retrieved 14 June 2014. ^ "Key points of Preity Zinta's molestation complaint against ex-beau Ness Wadia". The Indian Express. 14 June 2014. ^ "Ness Wadia threw burning cigarettes at my face: Preity Zinta to police".